The sub-£200 graphics market is where the bulk of most PC gamers' cards come from. And the new Gigabyte Radeon HD 7850 OC just manages to sneak in under that all-important price. Since the original AMD Radeon HD 7850 landed in March, we've seen it as an ideal card to drop into a very capable mid-range gaming machine. 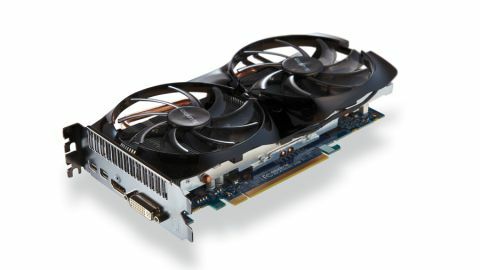 If you're rocking a 1080p display, this card will happily dish up the frame rates to keep things silky smooth. It was also a very good overclocking GPU, and even with smaller, redesigned PCBs like the one supporting this Gigabyte chip, it has the chops to push the speeds up higher. This card is even smaller than the diminutive Nvidia GTX 560 Ti, which is still an excellent mid-range beastie. The HD 7850 is no power hog either, thanks to the single 6-pin PCIe power connector drawing the juice directly from your power supply. At a core clock of 975MHz, the Gigabyte HD 7850 represents a decent 115MHz boost for the extra £20 you're paying out over the vanilla card. That said though, you'd have hoped it would have pushed the card right up to the 1GHz mark. That was probably a marketing decision rather than a technical limitation though. With the Radeon HD 7870 big brother marketing itself as the 1GHz Edition, having an OC version of its wee sibling seemingly devaluing that clock speed might confuse things. Sadly, the speed boost doesn't really deliver the extra frame rates we hoped for. In the best case scenario of DiRT 3 we managed a 10 per cent increase, but in our other gaming benchmarks the level was much lower - around the mid single digits percentage increase in pace. What you do get, however, is Gigabyte's impressive Windforce GPU cooling system. The wide twin-fan setup sitting atop the heatsink and fat copper heatpipe array do a great job of chilling the overclocked chip. At full load we were looking at shaving a full 10°C off the temperature of the stock cooler design of the vanilla HD 7850. The only problem is that the stock cooler is impressive in itself, and when it comes to overclocking these chips, we hit the limitations of the silicon when we push speeds up - not thermal brick walls. As such, we weren't able to push the Gigabyte HD 7850 any further than the 1,050MHz we managed on the vanilla Radeon HD 7850. It was much cooler, which bodes well for this OC card's longevity, but at 66°C at full load we wouldn't expect the stock cards to be falling over before they've finished their useful lives. Interestingly, the extra 115MHz may only give you a few per cent extra in gaming frame rates, but that almost puts this card on a par with the Nvidia GTX 560 Ti 448 Core Limited Edition card. The extra £18 you're spending on this card doesn't get you a lot extra. You can push the standard card as far, though the 975MHz clockspeed means you don't necessarily need to go down that warranty-invalidating OC route yourself until you start to see frame rates in new games drop.